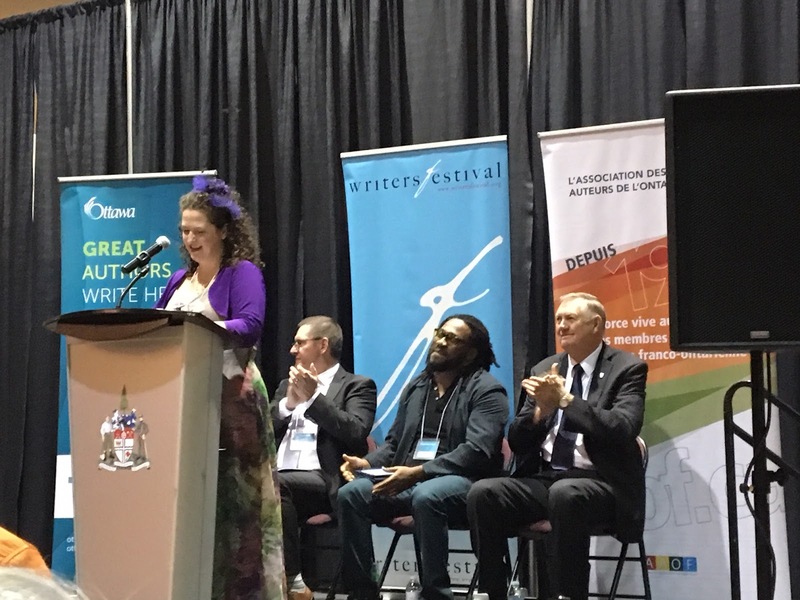 In case you hadn't heard, my brilliant spouse Christine McNair won this year's Archibald Lampman Award for Best Book of Poetry in the Ottawa Region (an award administered by Arc Poetry Magazine) at Ottawa City Hall on Wednesday night for her second poetry collection, Charm (Book*hug). Congratulations! Amazing hoorays! And, as she has been pointing out, she is but only a small handful of women to win such an award, after the thirty-something year old prize has gone, repeatedly, even, to a small handful of men. So, further hoorays! Further of the English-language Ottawa Book Awards (prizes are awarded in both French and English) included brand-new-father Shane Rhodes' Dead White Men (Coach House Books) [see my review of such here] winning the Ottawa Book Award (fiction category) and Roy MacGregor's Original Highways: Travelling the Great Rivers of Canada (Penguin Random House of Canada) winning the Ottawa Book Award (non-fiction category); MacGregor mentioned as part of his acceptance speech that they'd found out that day they needed a new furnace which, coincidentally, was going to cost exactly the amount he'd won as part of the prize, so he added relief to the surprise of his win. And yes, Christine was technically in Toronto on a course all last week; she actually flew home from Toronto just in time for the event, heading back out for another two days of course on some god-awful 7am Thursday morning flight. Could you blame her, not wanting to miss out on her first book award?